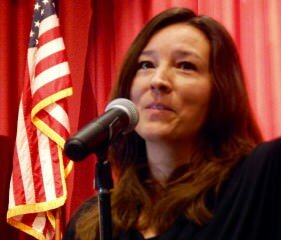 Monica Ratliff plans to run for City Council. It’s official. Monica Garcia announced Tuesday to her supporters that she will be running to retain her seat on LA Unified’s school board. Meanwhile, fellow board member Monica Ratliff surprised many education and City Hall watchers last week when she quietly took out papers with the Los Angeles City Ethics Commission to allow her to run for the City Council seat that is being vacated by Felipe Fuentes. She has named a treasurer, David L. Gould, based in Long Beach, to start collecting money for that campaign. She has also set up a new email to deal specifically with that race. Ratliff doesn’t want to publicly discuss leaving the board until the end of the school year, in mid-June, because she doesn’t want it to disrupt work she is still doing with the district. She notified each of her fellow board members of her decision before it broke in the media last week, and she asked them not to discuss it. Monica Garcia has declared she’s running again. Garcia writes, “It has been an incredible honor to serve you for the last 10 years; together we have been able to increase graduation and reduce the dropout rate. I am looking forward to continuing our work transforming this district so that all children can learn to read, write, think, believe and be college ready and career prepared. But I need your help to win.” She asks for $10, $25 or up to $100 to help launch her campaign for re-election. So far, Garcia’s only declared competition, who also filed with the Ethics Commission, is Carl Petersen, a gadfly at the school board meetings who said he is purposefully moving into Garcia’s district to run against her. Petersen said that he and his wife, Nicole, will move into the heavily Latino district that includes Boyle Heights and South Los Angeles so he can run against Garcia. Petersen said he has two children who graduated from LA Unified schools and triplets who are still in district schools. He spoke often to the board about issues he had at schools in Granada Hills in the San Fernando Valley. Petersen ran last year against incumbent Tamar Galatzan, who was ousted by Scott Schmerelson. Petersen came in fifth in that election with 10 percent of the vote. “There will be people who will be suspicious of the fact that I will move into District 2 to enter this race,” Petersen writes in his newsletter. “I understand your concern and assure you that I am doing so because our children need a parent on the board to fight for them. I am taking the fight to District 2 because Monica Garcia has lost touch with the needs of the children and represents the worst attributes of our dysfunctional school board.” Garcia offered no comment about Petersen’s intention to move into her district to run against her. Next year, three of the seven board seats are up for re-election: District 2 of downtown and East Los Angeles (Garcia’s seat), District 6 of the northeast San Fernando Valley (Ratliff’s) and District 4 of the Westside and Hollywood, currently held by board president Steve Zimmer, who is expected to run again for his seat. So far, Nick Melvoin is the only person who has declared for the District 4 seat, but there’s still time. Candidates for school board don’t have to declare they will run until June. These three seats on the board run through June 30, 2017. The remaining board members are elected through Dec. 13, 2020. It’s likely the school board elections will fall along lines of strong charter supporters, such as Melvoin and Garcia, and be hugely expensive. The last election resulted in a mixed bag between the pro-reform and pro-union camps. Ref Rodriguez, who helped start a charter school, won, as did Schmerelson, who has vocalized a strong distaste for a proliferation of charter schools. Richard Vladovic and George McKenna were re-elected to their districts. School board members who choose to serve full time earn a little over $45,637 a year, about the equivalent to a first-year’s teacher salary in the district. 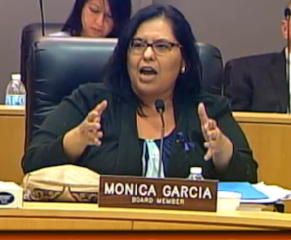 Ratliff, Garcia, Zimmer and Rodriguez take part-time salaries as school board members, accepting $26,346 a year. On the other hand, City Council members earn nearly $190,000 a year, far more than Ratliff could earn as an elementary teacher, her former job. LA has one of the highest salaries for elected council members in the country. The school board terms are for four years, and there are three term limits. The City Council seats are also four years but limited to two terms. Ratliff faces 12 opponents for the City Council seat, but that’s no daunting task for her. She faced 13 candidates in the last school board election, and she was vastly outspent by her primary challenger, Antonio Sanchez, who raised about $2.1 million. Ratliff raised just under $88,000. Ratliff is known for her interest in stabilizing the school board’s budget, and she was often teased by former Superintendent Ramon Cortines for her persistent questioning. Fellow board members, even when they contend with her, have yielded to her deep-dive questioning and analysis of complex budgets, which has led to uncovering problems with the MiSiS computer system and various ways of saving the district money. In recent weeks, Ratliff visited city and civic groups and met with neighborhood councils that advise City Council members. Garry Fordyce of the North Hills West Neighborhood Council said he was impressed with Ratliff when he met her at one of those community meetings and followed her to other events that she led, including the recent town hall with new Superintendent Michelle King. So far, no one has thrown his or her hat in for Ratliff’s seat, and no one is speculating yet who will run. Stay tuned. *Corrects that the school board is now limited to three terms.